ARGAN KERATIN SILK is a revolutionary, ultra-light, express spray conditioner recommended for every type of hair, especially dyed and damaged. The conditioner works in two phases: in REGENERATIVE 360° phase the hair is expressly, deeply nourished and rebuild; SHINE&VOLUME phase concentrates on giving the hairstyle healthy shine, volume and bringing up the colour. Innovative, intelligent formula of the conditioner does not weigh t down the hair despite the rich content of active ingredients! After using conditioner the hair is velvety smooth and shiny and the hairstyle gains shape, volume and durability. The conditioner perfectly protects the hair against the external factors. It facilitates combing and disciplines hair. 1. Intensely regenerates hair and tips. 5. Facilitates combing and styling. 8. Increases volume and hair style durability. 9. Enhances the colour of dyed hair. 10. 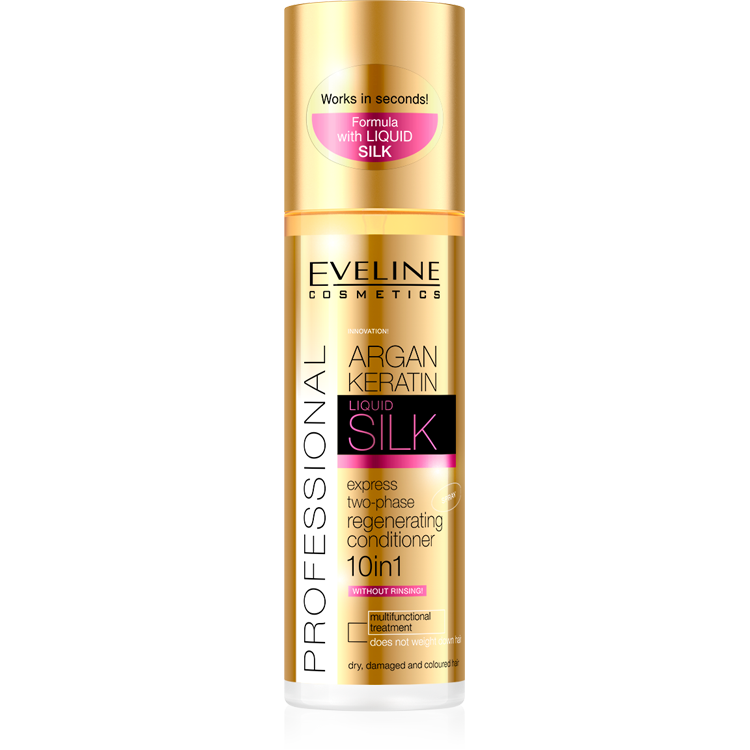 Protects hair against external factors. Shake well before use. Evenly spray wet or dry hair on their entire surface or only at their tips. Do not rinse. Do not apply on irritated scalp. Application onto dry hair prolongs the hair freshness.